The group was first inspired by the classic Truchet tiles, which are square tiles with two diagonally symmetrical arcs of DNA on the surface. There are two rotationally asymmetrical orientations of the arc pattern (see image below). Allowing a random choice of the two tile orientations at each location in the array, the pattern will continue through neighboring tiles, either becoming loops of various sizes or exiting from an edge of the array. Different types of global patterns emerge when tiles are marked with different local patterns. For example, if each randomly oriented tile carries a "T" rather than two arcs, the global pattern is a maze with branches and loops rather than only loops (see images below). If the self-assembly rules constrain the possible relative orientation of neighboring "T" tiles, it is possible to ensure that other than a single "root," the branches in the mazes never close into loops—producing trees. To explore the full generality of these principles, Qian's team developed a programming language for random DNA origami tilings. "The potential applications are much broader," Qian adds. Since the 1990s, random one-dimensional chains of polymers have been used to revolutionize chemical and material synthesis, drug discovery, and nucleic acid chemistry by creating vast combinatorial libraries of candidate molecules and then selecting or evolving the best ones in the laboratory. "Our work extends the same principle to two-dimensional networks of molecules and now creates new opportunities for fabricating more complex molecular devices organized by DNA nanostructures," she says. The paper is titled "Programmable disorder in random DNA tilings." This work was funded by the National Science Foundation, a National Institutes of Health National Research Service Award, and the Burroughs Wellcome Fund. 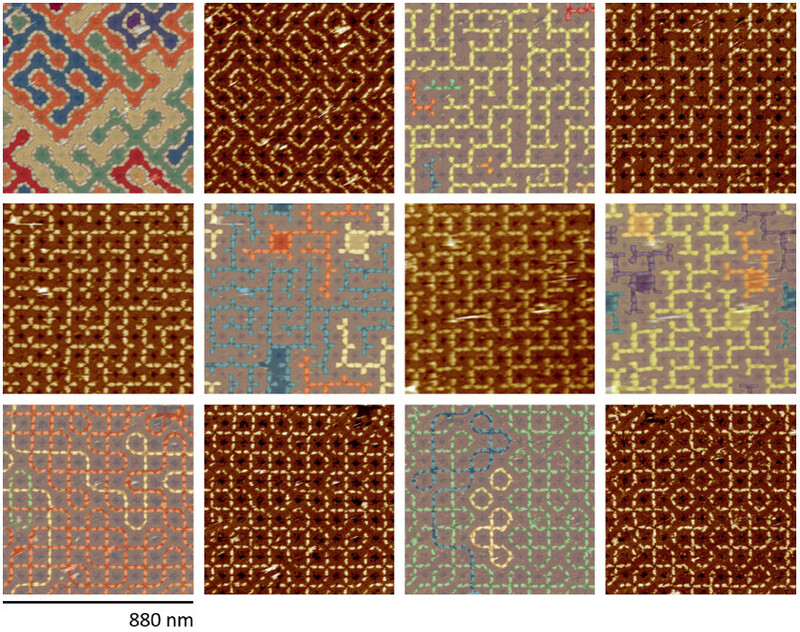 Colored atomic force microscope image of self-assembled random tree structures on the surface of DNA tile arrays. Each tree has a single loop as the “root”.